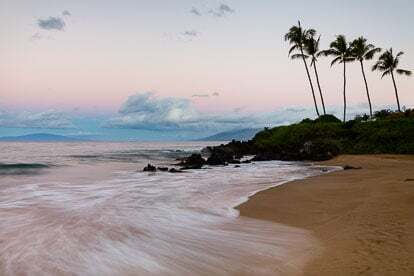 Dawning Blush - Pink skies at daybreak illuminate the gently breaking waves along the shore of Polo Beach in Maui, Hawaii. 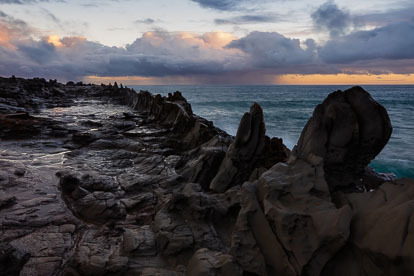 Daybreak Drama - Stormy clouds and a rain squall over the ocean are illuminated by early morning light beyond the rocky Dragon's Teeth formation on the northwest coast of Maui, Hawaii. 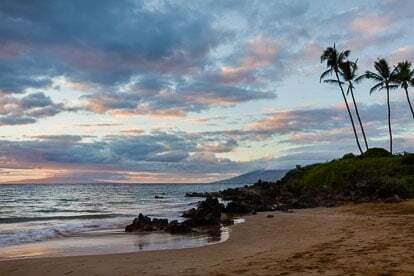 Sunset Serenity - The setting sun bathes the island of Lanai and the clouds above in golden light as seen from Polo Beach in Maui, Hawaii. 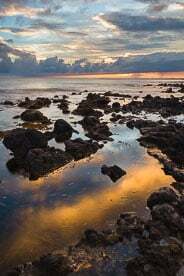 Shoreline Serenity - The sun rises behind a bank of clouds, filling the sky with golden light and reflecting in a pool along a rocky shoreline on Waipouli Beach in Kauai, Hawaii. 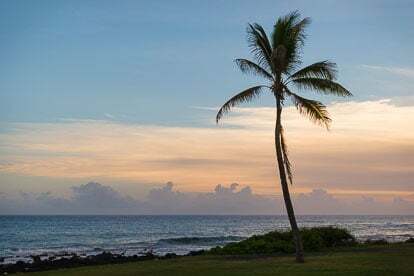 Seaside Tranquility - A lone palm tree is silhouetted against an orange sunset sky at the Poipu Beach Park in southern Kauai, Hawaii. 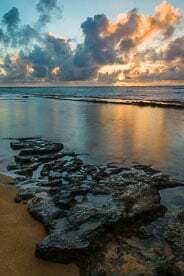 Frenzied Dawning - The orange ball of the sun radiates shafts of light skyward through the clouds as it rises over the horizon off a rocky shoreline pounded by waves on the east coast of Kauai, Hawaii. 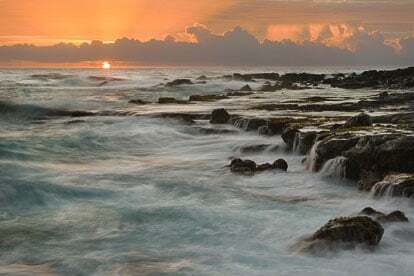 Fleeting Finale - The setting sun peeks out from behind a cloud bank and reflects in tide pools along the rocky shore at Poipu Beach Park in Kauai, Hawaii. 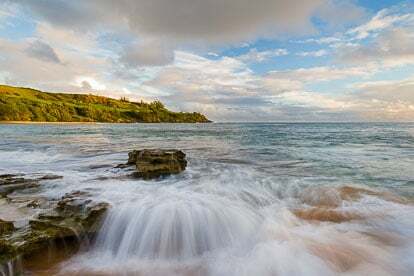 Morning Rush - Waves rush into the rocky shoreline in Moloaa Bay as the early morning light illuminates the lush green hillside in the distance on the northeast coast of Kauai, Hawaii. 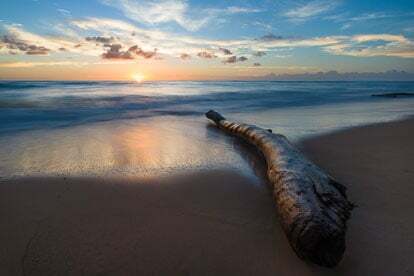 Gentle Dawning - The sun peeks over the horizon shining delicate light on a weathered log resting on a beach in eastern Kauai, Hawaii. 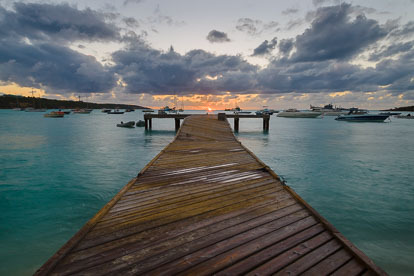 Sunset over the Pier - The setting sun glows on the horizon off the end of a pier in Road Bay, Anguilla. 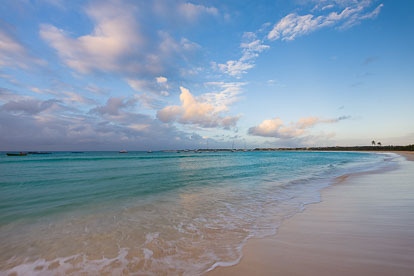 Seaside Serenity - Early morning clouds reflect in the turquoise waters of the Caribbean Sea off the island of Anguilla, BWI. 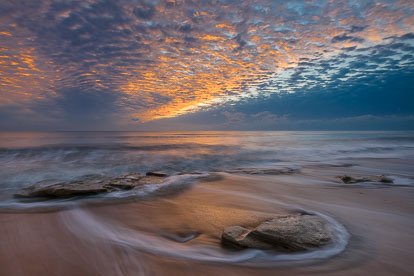 Light Up the Sky - The rising sun illuminates the breaking cloud cover over a rocky beach in Washington Oaks Gardens State Park, Florida. 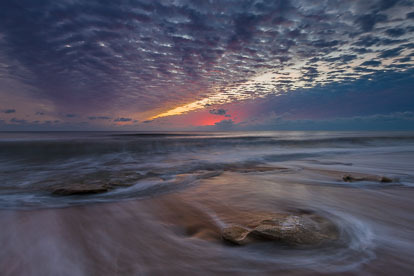 Here Comes the Sun - The horizon glows in pink dawn light over a rocky beach at Washington Oaks Gardens State Park, Florida. 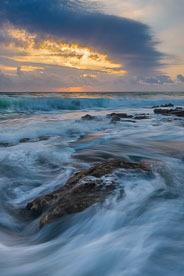 Morning Fury - Waves crash into a rocky beach at sunrise in Coral Cove State Park, Florida. 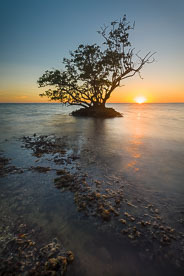 Lone Sentinel - A lone mangrove tree stands silhouetted against the setting sun on a shallow rocky shoreline outside of Everglade City, Florida. 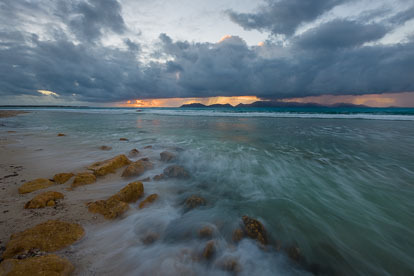 Foreboding Skies - The rising sun illuminates the tops of heavy rain clouds at Merrywing Bay in Anguilla, BWI. 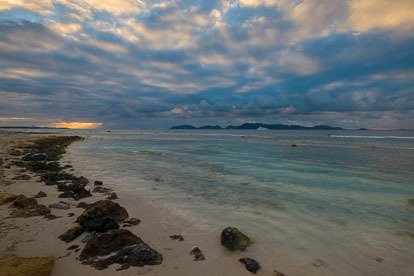 Morning Rays - Clouds on the horizon stream sun rays into the sky at sunrise on Cove Bay in Anguilla, BWI. 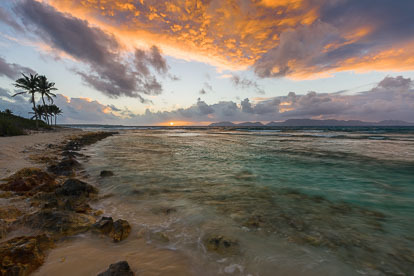 Golden Shoal Bay Sunset - A golden sunset as seen at Shoal Bay West in Anguilla, BWI. 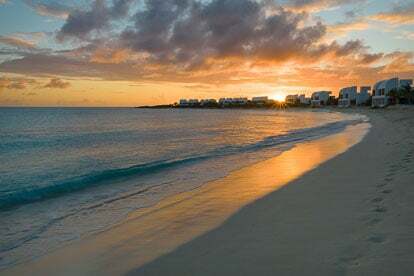 Sunset Stroll - A person strolls the beach as the sun sets on the horizon at Shoal Bay West in Anguilla, BWI. 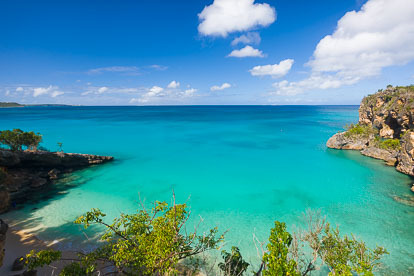 Caribbean Colors - A beautiful view across the ocean from above Little Bay in Anguilla, BWI. 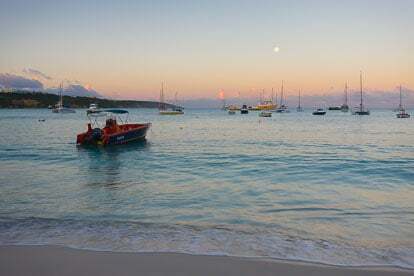 Dawn at Road Bay - Dawn comes to the harbor at Road Bay in Anguilla, BWI. 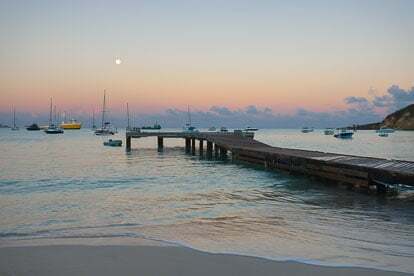 Pink Skies Over the Pier - The pink skies of dawn as seen at Road Bay in Anguilla, BWI. 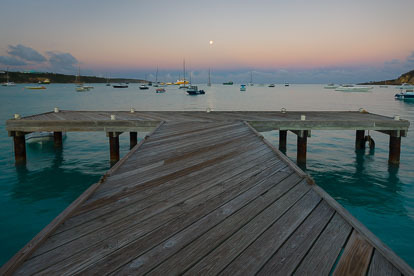 Moonset over the Pier - The full moon sets in the distance as seen from a pier on Road Bay in Aguilla, BWI. 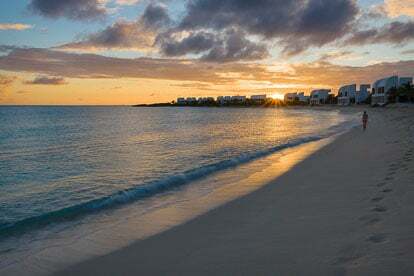 Golden Sunrise View - Lounge chairs invite you to sit down and watch the golden sunrise over Shoal Bay West in Anguilla, BWI. 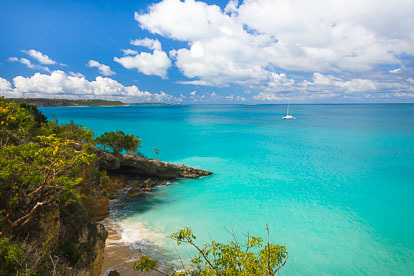 Road Bay Overlook - The colors of the Caribbean are seen overlooking Road Bay in Anguilla, BWI. 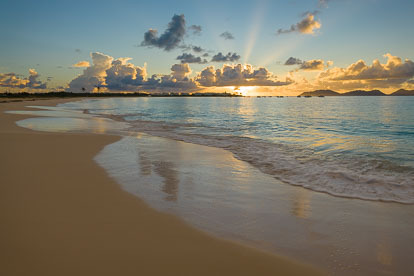 Sunrise at Merrywing Bay - A golden sunrise on Merrywing Bay in Anguilla, BWI. 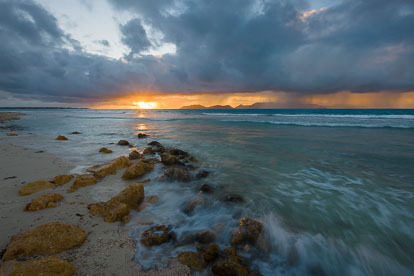 A Break in the Clouds - The rising sun pierces through a break in the clouds at Merrywing Bay in Anguilla, BWI. 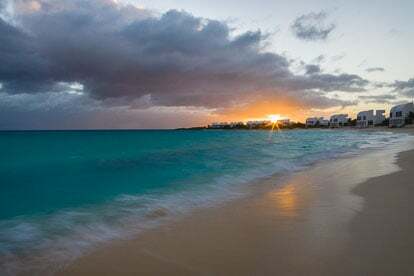 Sunrise Storm over St. Marten - A rmorning rain storm sweeps over the island of St. Martin as seen from Merrywing Bay in Anguilla, BWI. 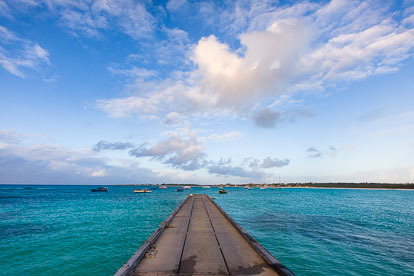 Pier to Paradise - A fishing pier juts into the beautiful waters of Cove Bay at Anguilla, BWI. 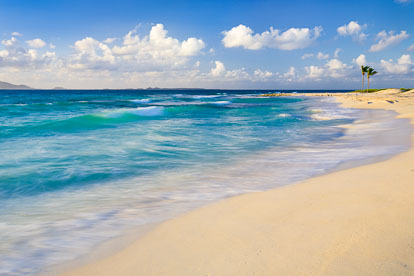 Cove Bay Magic - An inviting view of Cove Bay in Anguilla, BWI. 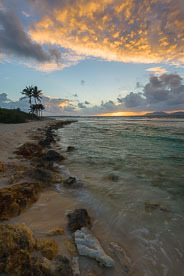 Sunrise Show at Merrywing Bay - Vertical - The clouds light up as the sun rises above the horizon at Merrywing Bay in Anguilla, BWI. 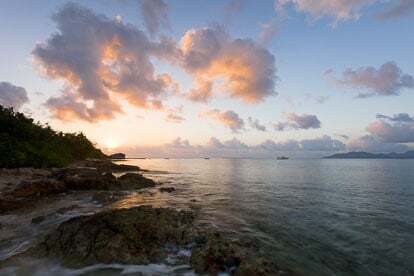 Sunrise Show at Merrywing Bay - The clouds take on an orange glow as the sun rises above the horizon at Merrywing Bay in Anguilla, BWI. 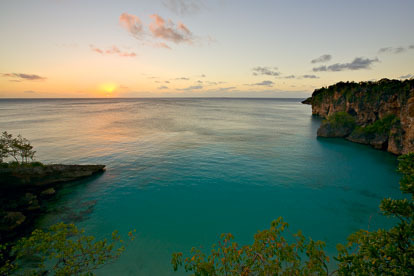 Serene Shoal Bay Sunset - The setting sun shines its last light on Shoal Bay West in Anguilla, BWI. 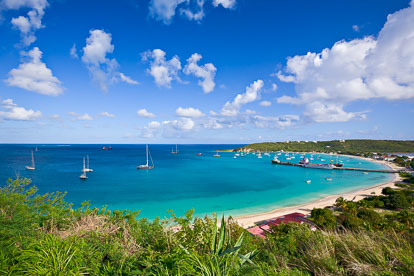 Crocus Bay - An inviting view of Crocus Bay in Anguilla, BWI. 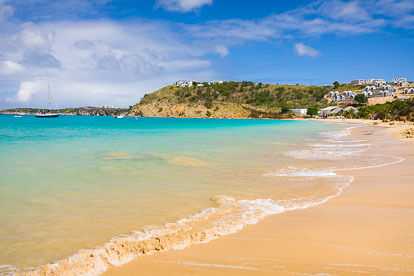 Little Bay - Tropical view overlooking Little Bay in Anguilla, BWI. 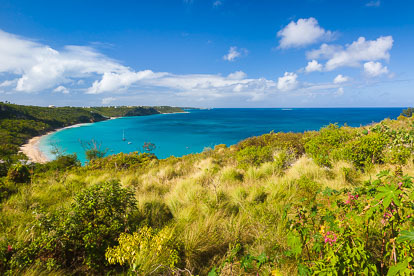 Crocus Bay Overlook - Beautiful view from above Crocus Bay in Anguilla, BWI. 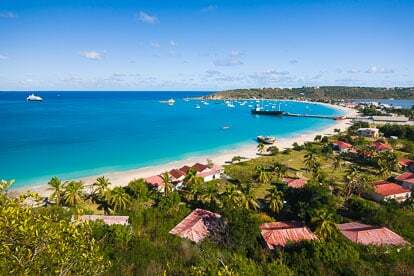 Caribbean Colors - Beautiful view from above Crocus Bay in Anguilla, BWI. 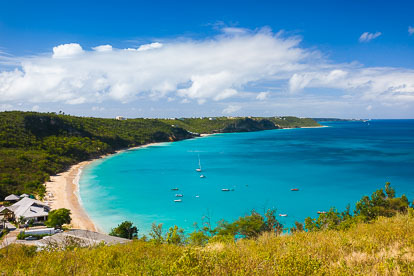 Mead's Bay - A tropical view of Mead's Bay in Anguilla, BWI. 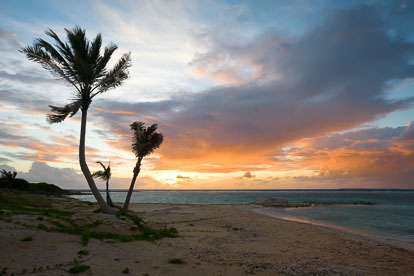 Serene Sunrise - The rising sun lights the clouds and bathes Forest Bay in pastel colors in Anguilla, BWI. 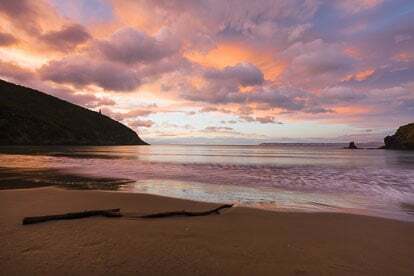 Morning Glory - Rain clouds break up and take on glorious pastel shades at dawn at Whites Bay in New Zealand. 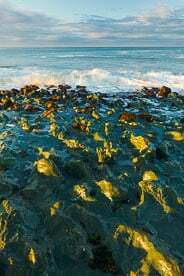 Aqua Ripples - Aqua colored rocks seem to mimic the waves on the rocky shoreline of the South Island near Riverton in New Zealand. 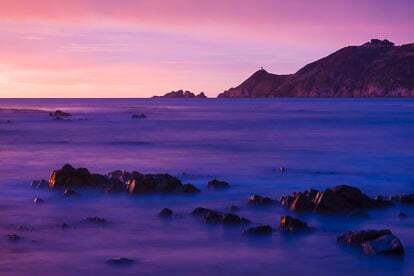 Pretty in Pink - Sunrise turns the skies and the sea pink with the Nugget Point Lighthouse perched on the point in the distance at Kaka Point on the South Island, New Zealand. 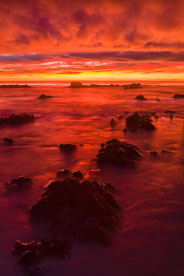 Fire in the Sky - The sun rising over the horizon turns the sky shades of orange and red that are reflecting in the rocky waters along the coast of South Island, New Zealand. 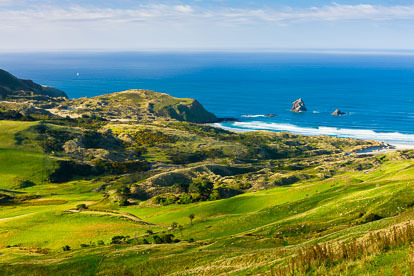 Sandfly Bay - The lush green terrain meets the sea at Sandfly Bay on the South Island in New Zealand. 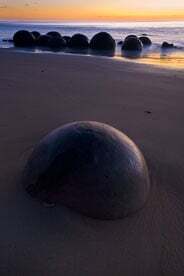 Moeraki Boulders at Dawn - Vertical - The golden light of dawn silhouettes the unusual Moeraki Boulders on the South Island of New Zealand. 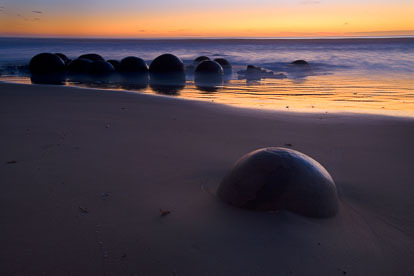 Moeraki Boulders at Dawn - Horizontal - The golden light of dawn silhouettes the unusual Moeraki Boulders on the South Island of New Zealand. 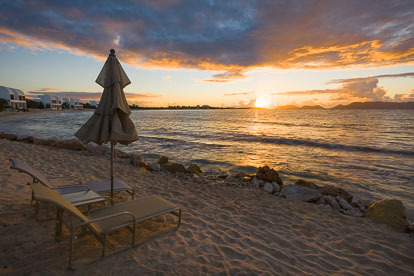 Cap Juluca on Maundy's Bay - Cap Juluca Resort on the edge of the Caribbean Sea in Anguilla, BWI. 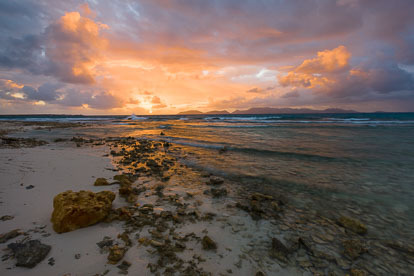 Forest Bay Sunrise - The rising sun turns the clouds and sky orange on the beach at Forest Bay in Anguilla, BWI. 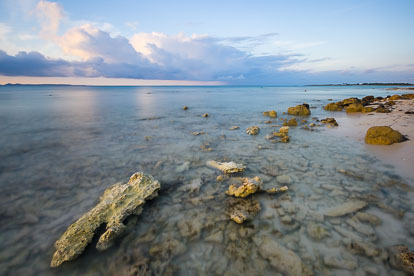 Pastel Sunrise on Merrywing Bay - A gorgeous pastel colored sunrise over Merrywing Bay in Anguilla, BWI. 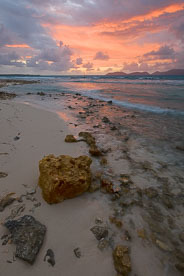 Pastel Sunrise on Merrywing Bay - Vertical - A gorgeous pastel colored sunrise over Merrywing Bay in Anguilla, BWI. 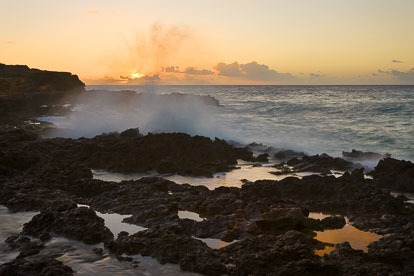 Crashing Sunset - The sun sets on the horizon behind crashing waves at Blolly Ham Bay in Anguilla, BWI. 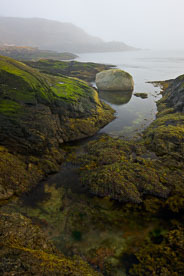 Foggy Seaside Morning - The fog lifts along the shores of the San Juan Islands in Washington. 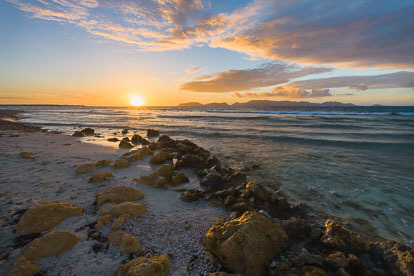 Peaceful Days End - The sun sets on the horizon over calm seas at Little Bay in Anguilla, BWI. 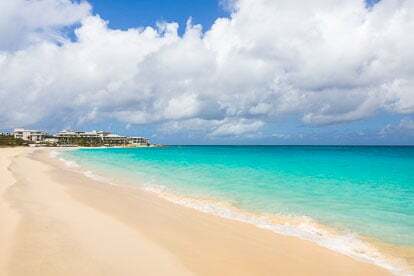 White Sand Beach - The Caribbean Sea laps the white sand beach at Merrywing Bay in Anguilla, BWI. 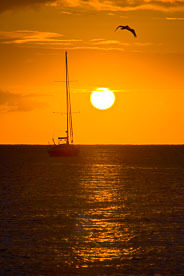 Sailor's Sunset - A blazing sun sets behind an anchored sailboat at Road Bay in Anguilla, BWI. 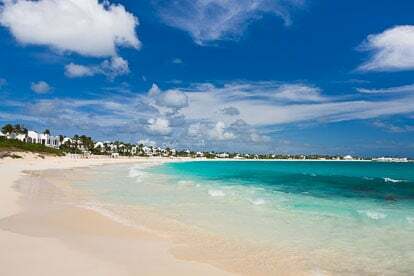 Overlooking Sandy Ground - A grand view of Road Bay in Anguilla, BWI.